THE Home Ministry's ban on the use of "Allah" by the Catholic Herald publication has once again raised the issue of Islam's position in Malaysia. Really? "The special position of Islam is enshrined and protected under the constitution," said senior federal counsel Mahamad Naser Disa during arguments in Herald's suit against the Home Ministry in the High Court. "Allah is the holy name and a special verse in Islam. Any deviation to the holy verse of Allah is an insult to the religion of the country and the Federal Constitution," he argued. 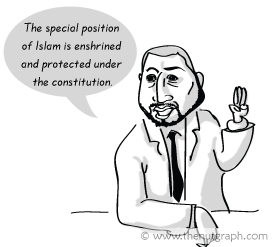 But does the constitution really place Islam in a "special position"? Was that the understanding of our nation's founding leaders? And if not, how are these conclusions being justified? Some of the Herald's critics have been lambasting the Catholic Church for suing the government over the use of "Allah". As Mahamad Naser argued, they say the Herald's insistence on the use of "Allah" diminishes Islam's "special position" as enshrined in the constitution. 1. Article 3(1) says Islam is the religion of the federation. b. Article 12(2) which allows the federal government to assist Islamic institutions. 3. No other religion has been specifically mentioned in the constitution except Islam. 4. The majority in Malaysia are Muslims. Zainul concludes that although Article 3(1) says other religions may practise their religions in peace and harmony, due to Islam's special position, they can only do so without interfering with the peace and harmony of the practice of Islam. 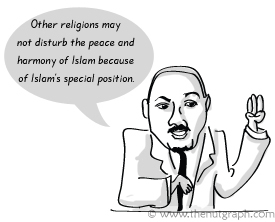 But where does it say in the constitution that Islam has a "special position"? The correct answer is actually, nowhere. This is unlike the "special position" of the Malays and natives of Sabah and Sarawak which is explicitly spelt out in Article 153 of the constitution. It cannot be said that as Islam is the religion of Malay Malaysians and since the Malay Malaysians have a "special position", therefore Islam also has a special position. By that measure, the religion of native Sabahans and Sarawakians, many of whom are Christians, would also have a special position. In any case, if the constitution's architects meant Islam to have a special position beyond what was stated in Article 3(1), wouldn't they have made sure that the constitution said so? The constitution in fact, suggests otherwise. Article 3(4) states that "nothing in [Article 3] derogates from any other provision of this constitution." This means that Islam as the religion of the federation does not diminish any other part of the constitution, including the fundamental liberties enshrined in Part II, in any way. Contemporaneous documents during the drafting of the constitution also demonstrate that Islam was never meant to have a "special position" as claimed. There were in fact clear assurances that other faith communities would not be hampered in the practice of their religions. 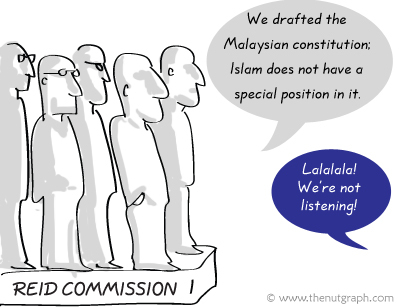 "There was universal agreement that if any such provision [on Islam being the religion of the federation] were inserted it must be made clear that it would not in any way affect the civil rights of the non-Muslims," said a report by the Reid Commission, the drafters of the Malaysian constitution. (Corrected) The Reid Commission held extensive consultations with various interested parties, including the Alliance which preceeded the Barisan Nasional, and the Malay rulers. Indeed, Universiti Malaya historian Joseph M Fernando cites written evidence that Umno representatives specifically assured their non-Muslim counterparts that Article 3(1) would have "symbolic" significance rather than practical effect. Fernando quotes the remarks of former MCA president Tun Tan Siew Sin in Parliament: "[Islam as the religion of the federation] does not in any way derogate from the principle, which has always been accepted, that Malaya will be a secular state and that there will be complete freedom to practise any other religion." A 1988 Supreme Court decision by former Lord President Tun Salleh Abas also clarified what "Islam as the religion of the federation" means. After an examination of the historical facts and documents relating to the constitution, his judgment stated: "...we have to set aside our personal feelings because the law in this country is still what it is today, secular law, where morality not accepted by the law [does not enjoy] the status of law." So why is the senior federal counsel from the government taking a position contrary to the constitution, historical documents and a Supreme Court judgment? How could he argue against the historical documents that say that Article 3(1) was not meant to give Islam a "special position" in Malaysia and that non-Muslims are guaranteed freedom to practise their own religions? To be fair, Mahamad Naser may only be supporting the position of his superiors. After all, Datuk Seri Najib Razak, Tun Abdullah Ahmad Badawi and Tun Dr Mahathir Mohamad have all stated that Malaysia is an Islamic state. 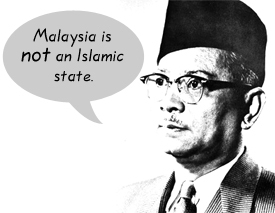 This is in direct contrast to Tunku Abdul Rahman, our first prime minister, and Tun Hussein Onn, our third, who expressly said that Malaysia is not an Islamic state. Can the constitution's meaning be changed by prime ministerial decree or popular opinion? If the government says it long enough and loud enough, does that mean we eventually have to accept that Islam being the religion of the federation means it has a special position? And therefore the "peace and harmony" of Islam must be considered first, before the peaceful practice of other religions? Instead of trying to read meanings into the constitution which were never there, the government should openly and honestly state its intentions. If its position is that Islam should have a special position in the constitution, it should propose constitutional amendments which can then be debated in Parliament. 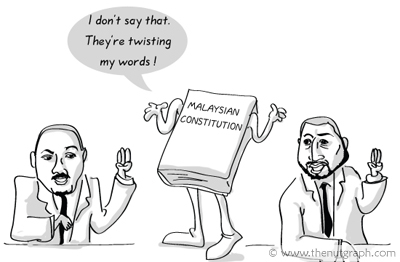 At least Malaysians would then be clear about the government's stand. If the government is unwilling to attempt to amend the constitution to correctly reflect their position, it should stop manipulating the electorate to accept as fact a constitutional myth unsupported by historical evidence. ALL MALAY = MUSLIM !!! “ The right to free speech ceases at the point where it comes within the mischief of the Sedition Act.